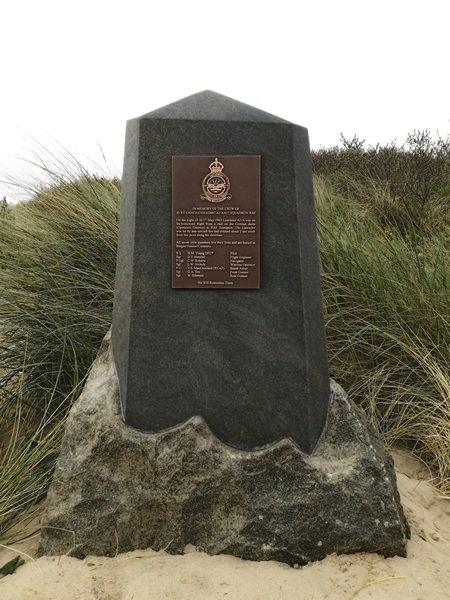 The objective of -The 617 Squadron Netherlands Aircrew Memorial Foundation- (617 Sqn-NAMF) is to commemorate national- and international the crew members and former crew members of 617 Squadron Royal Air Force who lost their lives in the Second World War. 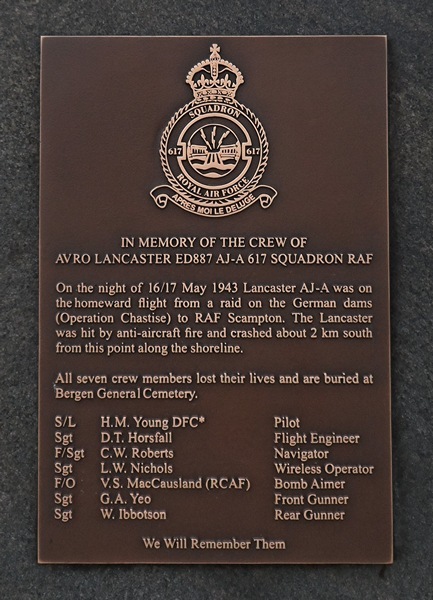 In the early morning of 17 May 1943, after a raid on the German Ruhr dams, Avro Lancaster AJ-A 617 Squadron 'Dambuster' was hit by German flak near Wijk aan Zee and crashed south of Castricum aan Zee (Netherlands), all seven crew members were killed. On 17 May 2018, this event was seventy-five years ago, as a tribute to the seven crew members a memorial plaque was unveiled on Friday 18 May 2018, at Castricum aan Zee.